These fajitas are anything but average. Fresh corn tortillas set the stage for chili-roasted peppers, onions, and jackfruit. If you’ve never had jackfruit before, you’re in for a treat! Related to the fig, it’s native to Southeast Asia and is composed of hundreds (or even thousands) of edible flowers. The texture will surprise you — cooked, it’s almost like pulled pork, and is absolutely delicious...especially with our tangy lime crema! Preheat your oven to 425 °F. Rinse and dry produce. Peel and slice the onion. Deseed and slice the red pepper. Mince garlic and set aside. Place the onion, red pepper, and jackfruit on a foil-lined baking sheet. Toss the with chili powder, 1 tsp oil, and a pinch each salt and pepper. Spread evenly, and place in the oven. Roast until golden brown and beginning to char, about 15 minutes. Remove baking sheet from oven. While the vegetables roast, wrap your tortillas in tin foil. When the vegetables are done roasting, you can put them in the turned off oven to gently warm until you’re ready to eat. Rinse and halve the lime. In a small bowl, combine juice from half of the lime, minced garlic, vegan sour cream and a pinch of salt and stir to combine. Rinse and dry the cilantro, then pick the leaves and tender stems. Remove the vegetables, jackfruit, and tortillas from the oven. On a large plate evenly divide the tortillas. 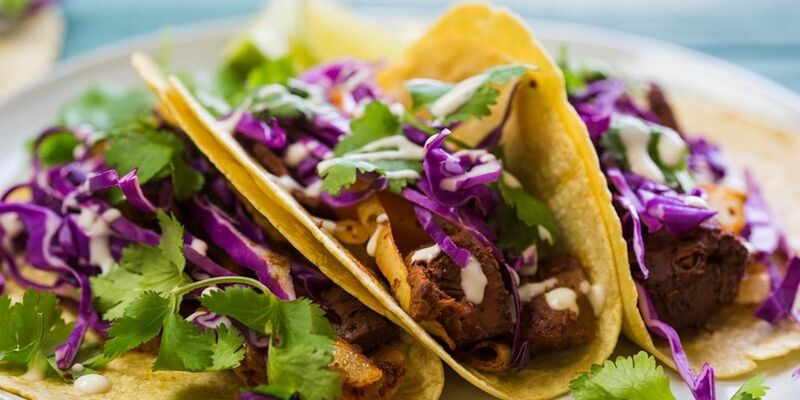 Top them with the with roasted vegetables and jackfruit, the red cabbage, cilantro, and drizzle with your lime crema. Enjoy!